Such a gorgeous and fun-loving couple! 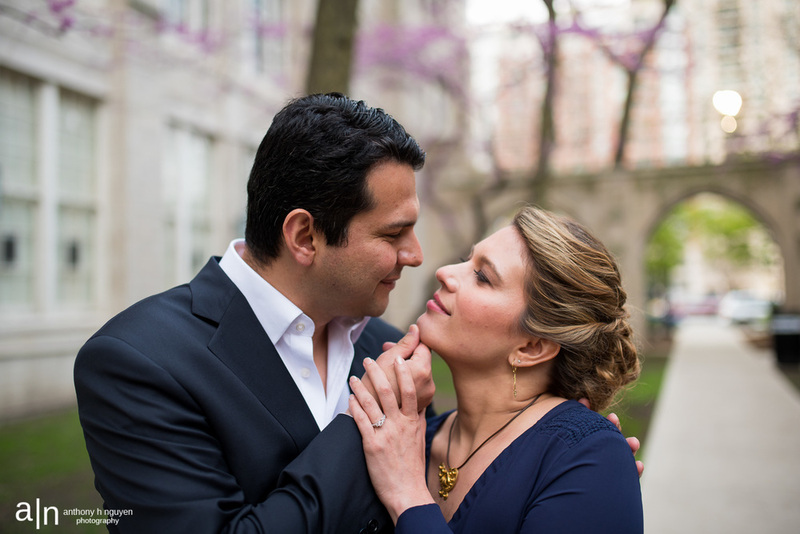 Suzanne + Pedro wanted an engagement session here in Chicago to reflect what she described as "Latin Romanticism." The weather had been a little touch-and-go during the week leading up to the session, but fortunately the rain predicted for the day didn't happen. Even though Suzanne + Pedro had a previous engagement session with another photographer down in Miami, they wanted a session here in Chicago to commemorate the significance of the City in their lives. I believe all couples should consider an engagement or couples session with their wedding photographer before the wedding. It's a less stressful photographic experience for all involved. Plus they get to experience any of my quirks! Both graduates of Northwestern University Pritzker School of Law, Suzanne + Pedro met at a Latino Law Students Association (LLSA) dance. Keeping this in mind, we discussed telling their love story in three parts with images reflecting three different moments in their romance. The story would unfold at Olive Park by the Lake, Northwestern University School of Law, Union Station, and Buckingham Fountain. Suzanne mentioned first meeting Pedro at a LLSA event/dance - so I was not surprised that when I asked them to embrace they naturally began to dance! After graduation, Pedro moved back to Florida for a year, which set up the next chapter in their love story. I love Union Station - it offers such a dramatic setting for engagement or wedding photography. ...and inside you have a large open space and the wooden benches that give off that classic transportation hub vibe! Suzanne + Pedro were so enthusiastic about acting out the moments of their love story - they naturally fell into what Suzanne referred to as the "telenovela" personas. While the adage is absence makes the heart grow fonder, nothing fans the flames of passion more than anticipation of a lover's return. Olive Park has such great views of the Chicago skyline! Plenty of open spaces and benches to lounge. The park was pretty quiet and we were basically the only ones in the observation area. We wrapped up the session at Buckingham Fountain. I love the Fountain at night because the Fountain's lights and the lit up city make for a stunning backdrop to any image. A gorgeous end to a fun filled day! Thank you Suzanne + Pedro for allowing me to tell your love story! I'm looking forward to your wedding day!